Bladder cancer rates have been elevated in northern New England for at least 5 decades in males and females, which suggests environmental causal factors. The high proportion of private domestic wells in this region and the prevalence of arsenic in such wells led to the hypothesis that arsenic in drinking water from private wells may play a role the elevated bladder cancer rates. 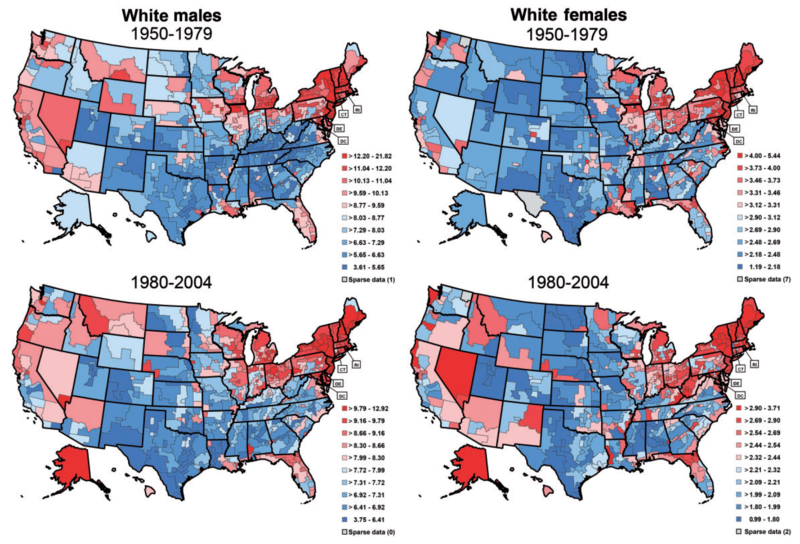 A map of bladder cancer mortality rates (age-adjusted 2000 U.S. population per 100 000) among white men and women by state economic area and time period (1950-1979 and 1980-2004). Figure 1 from Baris and others, 2016. Study finds bladder cancer risk was associated with water intake among participants with a history of private domestic well use. The trend was significant for participants who used shallow dug wells exclusively—a well type that typically has low arsenic concentrations but may have had higher concentrations historically. Bladder cancer rates have been elevated in northern New England (Maine, New Hampshire, and Vermont) for at least 5 decades compared to the rest of the United States. This excess is seen in both males and females, which suggests environmental causal factors. The high proportion of private domestic wells in this region with arsenic led to the hypothesis that drinking water from these wells may play a role in bladder cancer occurrence. In this collaborative study, scientists from the National Cancer Institute, Geisel School of Medicine at Dartmouth, the Departments of Health for Maine, New Hampshire, and Vermont, and the U.S Geological Survey (USGS) examined the role of private well water consumption and arsenic concentrations on bladder cancer risk. The study used approximately 2,300 participants (cancer patients and control subjects) and collected risk factor information consisting of lifetime water consumption (including water used in food preparation) to calculate total water intake. Lifetime arsenic exposure was calculated as the average annual arsenic concentration; arsenic daily intake was calculated as the average concentration times the number of liters per day of consumption. Cumulative arsenic intake and number of years with arsenic greater than 10 micrograms per liter were also evaluated. Ancestry, smoking, occupation, and use of wood-burning stoves, as well as shellfish and bracken fern consumption, were examined. The assignment of arsenic level was done by direct measurement of concentrations in current (2001-04) and past wells. The inability to sample many past wells required estimation of arsenic levels from models. Ultimately, arsenic level was assigned for more than 85 percent of exposure years for nearly 90 percent of study participants. Bladder cancer risk increased with increasing water intake; however, bladder cancer risk was significantly associated with water intake among participants with a history of private domestic well use. The trend was significant for participants who used shallow dug wells exclusively, and particularly dug wells used prior to 1960—a well type that typically has low current arsenic concentrations but may have had larger concentrations historically. Cumulative arsenic exposure had twice the risk in the highest compared to the lowest exposure group. Of the factors not related to water intake, only smoking and occupation (well-known risk factors) were related to increased bladder cancer risk, but neither factor appeared to play an important role in the New England bladder cancer excess. Our findings support an association between low-to-moderate levels of arsenic in drinking water and bladder cancer risk in New England. The findings increase the understanding of a potential source of contamination (from land application of agricultural arsenic-based pesticides) that has not been seen in recent times, perhaps because the hazard has been diminished (such pesticides are no longer in use) or because shallow wells, once dominant in the region, have been largely replaced by deeper wells drilled into fractured crystalline bedrock. Although the increase in risk associated with use of deeper drilled wells was not significant, these newer deep wells have recently been identified as having high arsenic concentrations throughout New England. Study results are expected to increase awareness of the potential for drilled wells to cause exposure to arsenic and the potential link to future adverse health outcomes in New England. This study was supported by the Intramural Research Program of the National Institutes of Health, National Cancer Institute, Division of Cancer Epidemiology and Genetics (contract N02-CP 01037). Baris, D., Waddell, R., Beane Freeman, L.E., Schwenn, M., Colt, J.S., Ayotte, J.D., Ward, M.H., Nuckols, J., Schned, A., Jackson, B., Clerkin, C., Rothman, N., Moore, L.E., Taylor, A., Robinson, G., Hosain, G.M., Armenti, K.R., McCoy, R., Samanic, C., Hoover, R.N., Fraumeni, J.F., Jr., Johnson, A., Karagas, M.R., and Silverman, D.T., 2016, Elevated bladder cancer in northern New England—The role of drinking water and arsenic: Journal of the National Cancer Institute, v. 108, no. 9, doi: 10.1093/jnci/djw099.